Dogs Luv Us and We Luv Them: Snow Dogs or Beach Dogs? Snow Dogs or Beach Dogs? They say no two dogs are exactly alike, and that's certainly the case with my dogs, Icy and Phoebe! My Siberian Husky, Icy, is a Snow Dog for sure! I've got my tush high in the air for a reason, Come Play in the Snow With Me!! How dare you ask me a question, can't you see I've got a ball stuffed in my mouth?!? But my dog Phoebe, a Havanese/Maltese/Bichon kind of mix is definitely a Beach Bunny! Mmmm, this sand tastes pretty good! What about your pets, are they snow bunnies or beach bunnies? Tell us in the comments! THIS IS THE BLOGPAWS WORDLESS WEDNESDAY BLOG HOP!! Harley has no real preference at all. Jaxson is a lover of all climates, so he's a Snow Bunny AND a beach dog! You both look super duper happy! Sadly, Ruby is not crazy about the snow or the beach. I love both! Love it! And with the weather we've been having - today 70s and tomorrow snow and 30s - they both will have their wishes of being beach and snow bunnies! 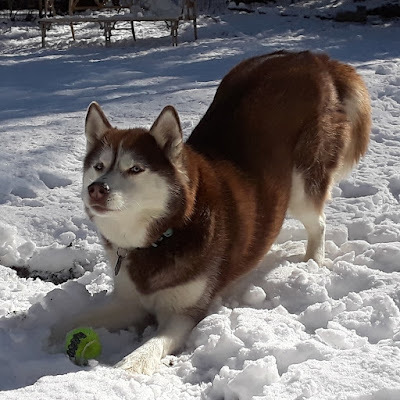 Chloe is the only one of my Huskies that I call the "Tropical Husky." If there is a sunspot, she will find it! If it is cold out, she will cry to come in and snuggle on her bed! The others are snow bunnies for sure! Give them a good snow day, and they are happy! I hope Icy enjoys tomorrow's forecast! 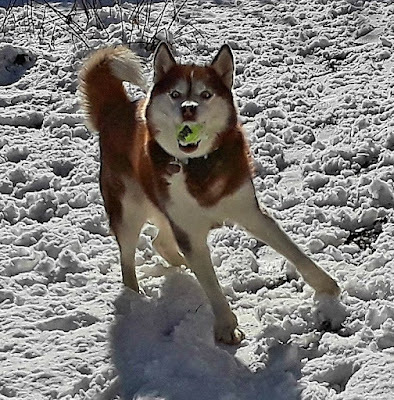 We are definitely NOT snow dogs but do enjoy it every few years for a day or two. BOL! Hopefully, we will get to check out the beach this summer in Texas. My dogs have always seemed pretty versatile...enjoying playing in the yard no matter the season. But they've never experienced an ocean beach...I bet they'd love that too! Oh this is such a lovely post. I can see that everyone has their own favourites, AND they are entirely different. Ours would totally hate the snow I can tell you that much!! I love your pictures and Icy really makes me smile with her enthusiasm.